Among all the jet fighter ROCAF, the F-5A and F-5B are arguably the types that have drawn the least public attention. This is probably because they had never seen combat in their service life with ROCAF and also because they were small in number (fewer than 100 in total). However, some of these F-5A not only had played an important role in international affairs but also may have fought real combats, though not in ROCAF markings. In this regard, the nickname Freedom Fighter seems rather appropriate. In 1972, the United States undertook Project Enhance and Project Enhance Plus to improve the combat capabilities of South Vietnam’s armed forces before the cease fire. As part of Project Enhance Plus, the US government requested that the ROC loan 48 of its F-5A to augment the Vietnamese Air Force (VNAF) during November 1972. Under the understanding in which ROC loaned the aircraft, the US agreed to station two squadrons of USAF F-4 in Taiwan until the loaned aircraft could be returned or replaced. The US also loaned 28 T-38A to ROC for 30 months to meet ROCAF training needs. The US was to return 20 F-5A to Taiwan, plus 28 new F-5E. The ROC government cooperated by sending 48 F-5A aircraft as well as spare parts and support equipment, including 17 J85-13 engines. Could the 1969’s F-5A, 22 total, were the first batch of fighter that Taiwan paid full price for, ie didn’t get any sort of discount under Military Assistance Program. 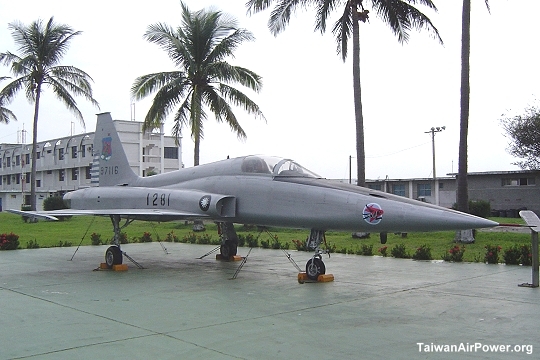 Remember that we were taught in Taiwan that F-5 were the first aircraft ROCAF bought with full price, without any US aid/assistance/money…. THE FIRST PRIORITY ITEM IN FY 76-77 IS THE F-5E/B PROGRAM ($83 MILLION). CREDITS PROVIDED IN FY-77 WILL COMPLETE OUR COMMITMENT UNDER THE F-5E/B MOU. ON COMPLETION OF THE PROGRAM, 100 F-5E’S WILL HAVE BEEN CO-ASSEMBLED/CO-PRODUCED, AND 12 F-5B’S WILL HAVE BEEN PURCHASED.